Director Tim Burton has always had a preoccupation with the peculiar, one which continues in this fantasy adventure. Jake Portman (Butterfield) has long been fascinated by his grandfather Abe’s (Stamp) astonishing stories. 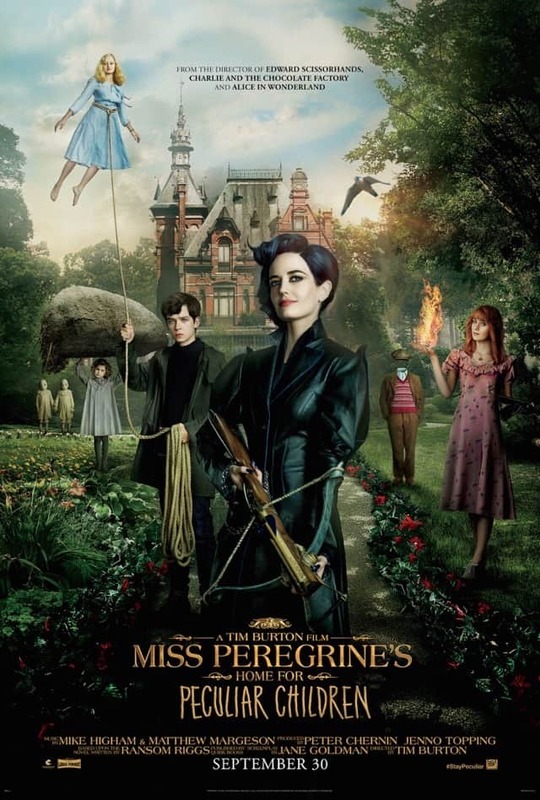 Abe claims to have spent time at an orphanage for children with unique, unnatural abilities, run by one Miss Peregrine (Green), who can take the form of her namesake bird of prey. Jake’s psychiatrist Dr. Golan (Janney) recommends that Jake visit this orphanage himself to find closure, and so Jake’s father (O’Dowd) takes him to Wales. On a small island, Jake discovers a portal to 1943 – the orphanage is stuck in a time loop generated by Miss Peregrine. Jake finds himself drawn to Emma (Purnell), who can manipulate air. The sullen Enoch (Finlay McMillan), who brings Frankenstein’s Monster-style creations to life, feels threatened by Jake. The evil Baron (Jackson) is on the hunt for Peculiars, with Jake and his newfound friends having to fend off Baron and his cadre of monstrous ‘hollowgasts’. Miss Peregrine’s Home for Peculiar Children is adapted from Ransom Riggs’ novel of the same name. This reviewer is completely unfamiliar with the book and its sequel, and thus cannot judge the film as an adaptation of the source material. Just going off the title alone, it would seem that Burton is the ideal fit to bring the story to the big screen, and for a time, it looked like he might not actually commit to the project. Screenwriter Jane Goldman of X-Men: First Class and Kingsman: The Secret Service fame brings some of the edgy wit seen in her other work to bear, but for the most part, this is pretty standard young adult stuff. There’s a chosen one who uncovers mysterious family secrets, gets inducted into a fantastical world he’s never known, falls in love, gains an eccentric but good-hearted mentor figure and has to fight a sinister organisation. While it may not be anything revelatory for those raised on a steady diet of Harry Potter and its ilk, the world of Miss Peregrine’s Home for Peculiar Children is still engaging. The mechanics of the fictional universe are laid out clearly enough and it’s generally pretty fun, not taking itself too seriously. As with any fantasy, there are some proper nouns to learn. For example, an ‘ymbryne’ is a female guardian of peculiar children who can shape-shift into a bird. It revels in the absurdity of it all without obnoxiously proclaiming “you are watching a Tim Burton movie”, which the director is prone to doing. The various abilities the children possess are at once shocking and amusing and in at least one case, genuinely disturbing. While there is an expected reliance on digital visual effects, we do get a fun sequence which makes use of old-fashioned stop-motion animation. The imagery is the right side of spooky: it will give children nightmares, but generally stops short of being completely traumatising. Butterfield does a fine job of being awkward and awestruck; ‘chosen one’ protagonists can get a little bland but he’s sufficiently likeable as a performer, so Jake doesn’t come off as merely a tabula rasa protagonist. The moment Green appears more than half an hour into the film however, it’s abundantly clear that this is her movie. She’s an actress who’s always acutely aware of the type of project she’s in, modulating her performance accordingly. Here, she’s essentially Professor X meets Mary Poppins. She appears to be enjoying herself and struts about with the utmost poise. The midnight blue streaks in Miss Peregrine’s hair, which take on a green tint in the right light, make Green even more mesmerizing than she usually is. One of Miss Peregrine’s Home for Peculiar Children’s shortcomings is an understandable one that afflicts many superhero films: the bulk of the characters are defined by their powers, and that’s about it. The incongruity of the children’s ordinary appearances and their flabbergasting abilities provides most of the humour. Purnell strikes a balance between confidence and gentleness, with Emma’s link to Jake’s grandfather making her an enigma that Jake feels he needs to solve. Alas, one can almost see the label reading ‘designated love interest’ hanging above her head. In a move that might vex faithful fans of the books, Emma and Olive (Lauren McCrostie) appear to have switched powers: in the book, Emma was pyrokinetic and Olive was aerokinetic (see, we’ve done a tiny bit of research). The Harry Potter series packed plenty of prestigious thespians into the adult supporting roles. Here, the mix of actors is a little more eclectic. Stamp is usually cast as cold, intimidating villains and here, he’s playing an affectionate if odd grandfather. Jackson’s colourful, over-the-top villain, who lisps a little on account of the prosthetic pointy teeth, is a little too over-the-top to be genuinely frightening. Younger children might be spooked by the hollowgasts, who are essentially takes on the internet urban legend supernatural being Slenderman, but because of their CGI-ness, they can be a little too synthetic to be actually scary. There’s also altogether too little of Dame Judi Dench in this, but James Bond fans will appreciate the brief reunion between M and Vesper Lynd. The world of Miss Peregrine’s Home for Peculiar Children has enough to it that we would be up for a sequel, but because it generally plays it safe as far as young adult fantasy stories go, it didn’t quite grab us. Still, it benefits from eye-catching visuals and an entertaining turn from Green in the titular role. Summary: It’s more adequate than extraordinary and is far from Burton’s most memorable, but Miss Peregrine’s Home for Peculiar Children is a fine marriage of director and source material and is pretty decent fantasy adventure stuff.